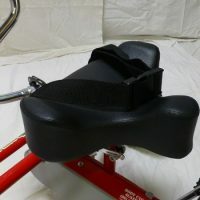 The Comfort Seat (19cm pictured on left) is standard on all trikes. The comfort Deluxe (22cm pictured on right) is wider , flatter giving more stability when needed but not as much as the pommel. Both are made from surgical gel, making them very comfortable. The Seat Belt can be fitted on all seats. It gives support around the hips for extra stability. 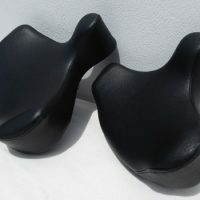 The pommel seat is designed to prevent the pelvis sliding forward. The pommel is made out of lower density foam so as to allow it to move sideways during transfers on and off the Cycle. 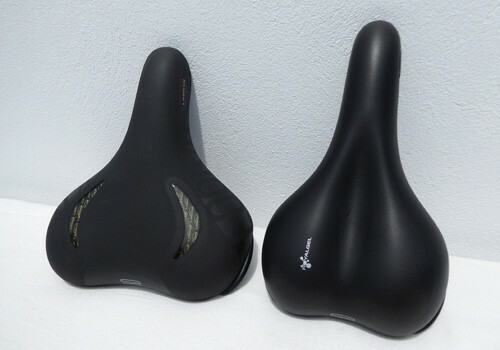 Two sizes available (29cm and 35cm).